I have been doing a lot of photography of graffiti lately. A lot of it is for my alleyways project, but sometimes there is just something about it that draws me in. This 5×7 negative is so detailed you can see the texture of the metal on the side of the train freight car right on the negative. I increased the contrast quite a bit in an attempt to put some more punch to it, but hopefully it works out. 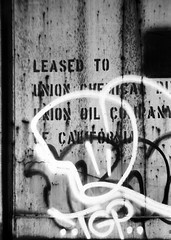 I also enjoy that this is a formal sign, saying that the car is leased to the Union train line, yet is also tagged with a particular graffiti artist’s work.